I’ve begun the process of reupholstering my vintage French Bergere sofa. Let me tell you, this is not for the faint of heart! But, it is doable! I’m taking it step by step and have the old upholstery off. I still have loads of small tacks to remove. 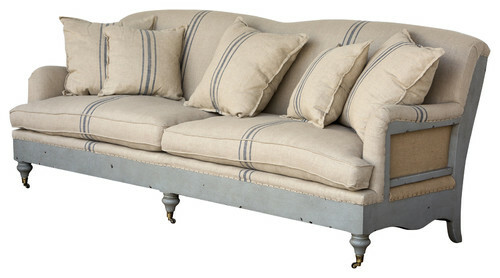 Thankfully, this sofa was really well made and the base – burlap, strapping, batting, frame, etc. are all in excellent shape. So, that will save me both time and money. Looking at the sofa in it’s deconstructed state, has me thinking about the deconstructed furniture trend. As a reminder of what the sofa looks like, here it is shortly after I purchased it. I do believe this is a trend that has been born of the popular farmhouse style. I don’t really see this style having much longevity. 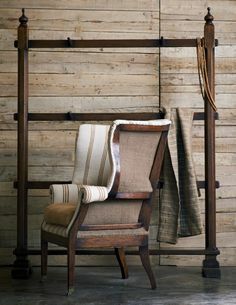 But, seeing the back of my sofa with is bare wood frame and hand-stitched burlap backing, does have me thinking about leaving the back bare? I do say I’m thinking about it, because I’m not quite sure. So, I decided to see what you think about this new trend in furniture. First, I’ll show you some examples of deconstructed furniture that have caught my eye. 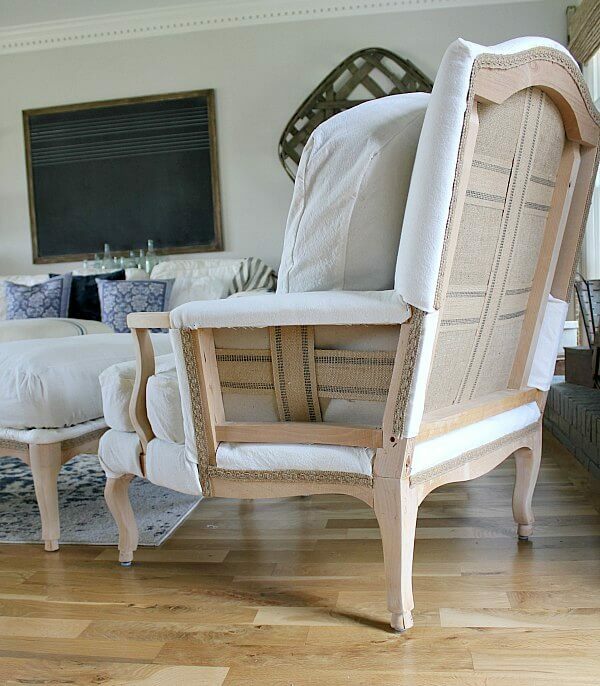 And, here are a few DIY deconstructed furniture pieces by fellow bloggers! Now, I’d love to hear what you think about deconstructed furniture! And, more importantly, should I leave the back of my vintage sofa open with the frame exposed and burlap showing – maybe just temporarily? I’m so anxious to hear what you think, so please leave a comment! It is definitely a trend. For some reason I think this would tie into a steampunk style. It reminds me of that look. If you have found your momentum to reupholster your sofa – finish it. It will be like bringing a new piece of furniture into the house. If you have to ask… we girls know what we like. Just my humble opinion. Whatever you decide have fun with it!!! Blessings. I think it’s a nice look, as long as it’s neat looking. I don’t like it when you see threads and scraps of material still left on, as if it was ripped apart and left undone. But when it’s neatly exposed, like your examples, I think it has a lot of character. I would leave the back and sides exposed, but cleaned up. Then, if you don’t like it, just finish the job and cover it up. Have fun either way! It’s a beautiful piece of furniture, and even looks comfy. Go for it! 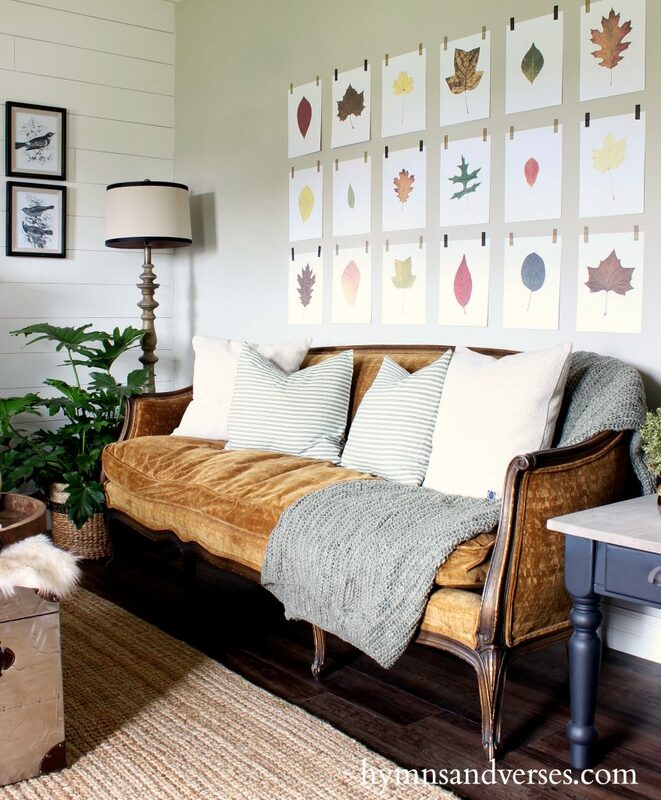 I have a similar sofa, chair and two wing chairs that I am planning to give the same treatment. Maybe not all four pieces. I’ll see as I go. Only because you asked… I am not a fan of the undone look. These are beautiful pieces of furniture, fancy furniture even, and they just lose the fancy when they don’t look finished. They just look like someone got tired of the reupholstering work. Your sofa is gorgeous and, only in my humble opinion, should have just as gorgeous an upholstery job. In the end, it is in your house and you are the one doing the work it is solely your decision. 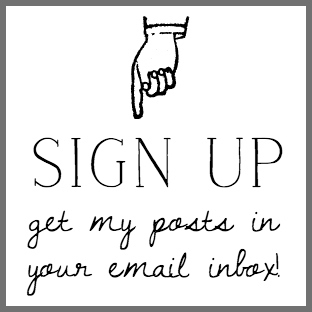 Love your blog and the things you share. Thanks for letting us weigh in and can’t wait to see the finished product whichever way you go. I have to also give you kudos just for attempting this! I agree with Jenny, looking forward to seeing what you decide and how it looks. 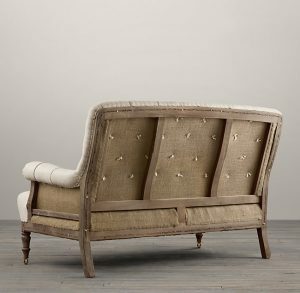 This is definitely not for me–front, sideways, or back.Just looks unfinished and like the upholsterer ran out of material. Finish it friend !!! There may be a house or two in the world where it looks good but not yours!!! You have an adorable house using your gifts as a decorator, don’t do it!!! While interesting, I’m with you on it being a trend that won’t last long! If it were me, I think I’d take the time & effort to finish the sofa now, because you sure don’t want to have to do it later, if you decide you don’t really like the trend down the road! What fabric are you doing the sofa in? I’m sure it’ll be beautiful!!! Pictures throughout the process please, if possible! I wholeheartedly agree with Cathy. You have started the project and already have the mindset that there is a lot of work involved. That piece is too beautiful to leave it in deconstructed state. I worked on two matching, deconstructed chairs and found them more work than completing the upholstering! I’ve seen some deconstructed pieces that look nice but it’s definitely a trend. I love your sofa and if it were mine, I’d finish reupholstering it. Can’t wait to see the fabric you choose! To me, it would depend a lot on what the back of your sofa looks like without the covering material. (I think my cats would have a heyday with those exposed elements)! One thing I did notice was that all your sample photos have chairs or sofas that are not up against a wall, so the entire back is exposed for viewing. If you plan on having your sofa against the wall, the only exposed areas would be the sides, and that doesn’t seem like enough to me. So many things to think about! I hear you with the cats! Sadie was really testing last evening. She really wanted to sink her claws into that burlap! Luckily, she’s scaredy cat and is afraid when we raise our voice! 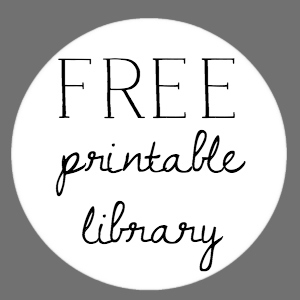 Has the password changed from the one we used in December to access the free printables library? No, it hasn’t. I’ll email you the password, Deborah! I always love the finished parts of these pieces, but the rough, exposed bones and unfinished back and sides just don’t appeal to me as practical or pretty. These pieces are already showing up in resale and consignment shops around here, so I think this is a short lived trend. 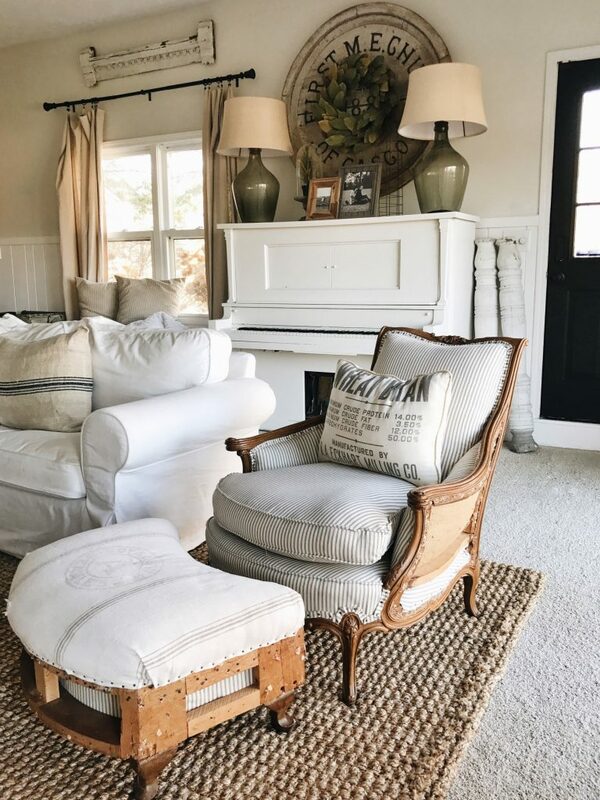 I love the “farmhouse” look and my house currently reflects this, but I think leaving your beautiful sofa with the burlap and straps exposed would look sloppy. Yes, “farmhouse” is probably a fad and will fade with time, but since we live on a farm I’m hanging on for awhile. I’m not a fan of the unfinished look. I’d say finish it off – it will be more timeless, you’ll gain more complements and it will be beautiful when done! It is a TREND! You have a Beautiful antique! 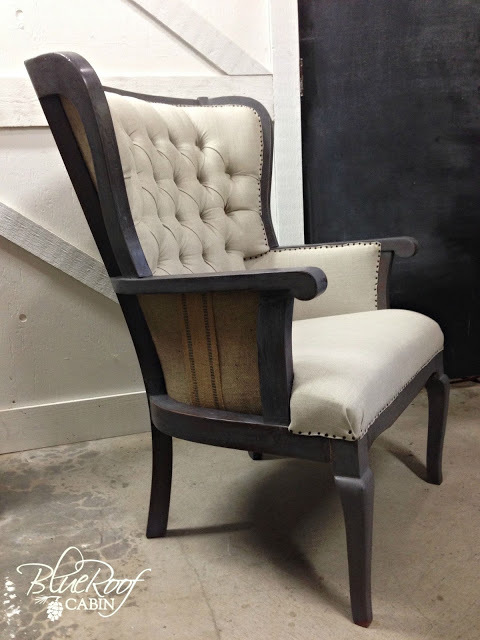 Restore it to its original character (with your choice of fabric) and it will be “priceless”. …for years to come! I absolutely love the idea of wall art and I’m so going to do that, Sandra! Thanks so much for the tip!!! I say leave it exposed in the back and on the sides. It will be a one-of-a-kind piece that will be custom made for only you. I love thinking outside if the box when it comes to decorating. Who wants cookie-cutter furniture? Go for it! Oh dear. I’m not popular. I did look at one source and it showed up as RH. I noticed they are already over it. Only one option is left in my area. Mist. But I like to do my own thing. It’s also possible to get the look on the side arm that shows yet have the back covered. Or let it be exposed I don’t know. I don’t know!! It would change the look of your home for awhile and why not??!! It’s a matter of more steps and you could change it. It’s not like it’s having to erase the look to move on. I’m curious now how you’d style your room with a deconstructed couch. What textiles? Accessories? Colors? And then be planning your upholstery project. For it can always be your back up plan to continue on and upholster it as so predictable!! It wouldn’t be my taste, but to each his own. I think it looks ridiculous! It looks like a lazy person started a project and realized they didn’t know what they were doing, so they just left it! I Saw a sofa just like yours at an auction at a old hotel this past summer, I wanted it so badly! I would leave it as is. You have good taste, so whatever you do will be nice! I LOVE your sofa! The deconstructed look is just plain ugly…sorry, my NY is showing🙄. Okay. I’m all alone on THIS island! Because I LOVE some of the really de-constructed chairs I have seen. In fact, we have a vintage chair of my in-laws in storage, and I’ve told hubby I want to take its upholstery off and see what I find! Not sure about a large piece/sofa … but knowing my eclectic tastes, I would probably like it, too. One thing I notice with some of the pieces in your photographs is that they seem re-built to “look” de-constructed. They don’t have the threads, the seemingly patinaed tacks, etc. They actually look too neat! I’d love to see a pic of your beautiful sofa stripped down to the base construction ~ at the “frame and springs and stuffing” level! Good luck, though, on whatever you decide, Doreen! 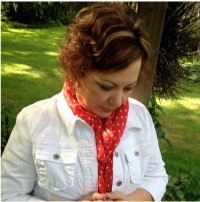 I follow a lot of blogs and I will admit that yours is one of my favorites! Beeecause, your style is polished and classy. It “feels” comfortable and fresh without being over the top trendy. I look these blogs for inspiration (Real inspiration! That is affordable without ditching everything I own!) With that being said, I believe if anyone can pull this off.. you can! But because of your style taste I believe you will eventually refinish the entire piece. So try it for a “season”.. as you did with the couch when you bought it..see if it “grows” on you. My bet, is it won’t 😉 I look forward to seeing the transformation! I don’t really like the look. I do believe it is trendy and won’t last long. But you can always try it out for a while and just finish it when you get tired of the look. You know, I think I would go for it. However like some others have said, purchase extra fabric so you could finish if after a while you tire of it or just decide you don’t like it. I do like some of the looks if it is a very finished look without threads, etc. hanging. I really do feel it would be unique. My sister and I did two wing chairs with the deconstructed look. They ended up being used for a wedding. We found it to be more work than the normal process of finishing and the wood that is used in construction is rough and requires a lot of sanding, but never finishes very smooth, because it was not intended to be exposed, when built. It will be fun to see your result, though! I like the deconstructed look. I think in this world of plastic and cheap metal, the reminder of how things were once built (to last generations) is beautiful, like a piece of art. But then, I’ve always loved the idea of seeing the construction of ordinary things and it reflects in my decorating style. Do what feels right to you! I agree that if you are asking, you are not quite “sold” on the idea of exposed construction. The idea of pictures as art is lovely and might give you the best of both worlds. I love your blog and your lovely home and I’m sure you will make the right decision for your space. Well I am certainly not into the deconstructed look, I want the finished piece. After all you a going to all the trouble of reupholstering this furniture, then it should be complete! You have excellent taste and will know when to you are nearing the end of this project what this piece needs. Have fun reading all the comments, seems like everyone wants you to ultimately decide what works for you in your home. 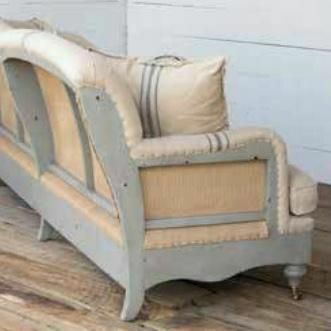 I saw this look on the Magnolia sofa and love seat. Although I thought it was cute. It did look like a simple trend and unfinished. Very good thoughts on deconstruction and really amazing ideas you given in this post. 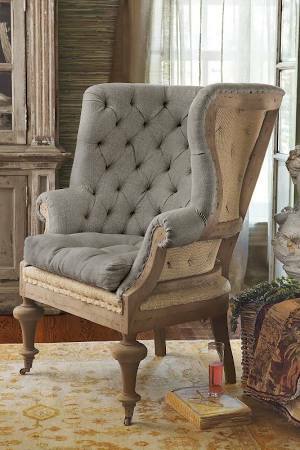 Hello, I am in the same situation, the proud owner of two beautiful old wingback chairs with beautiful lines on tons of possibilities. I also love the mixture of old world and new, so the deconstructed has my attention. However, I think unless your true farmhouse, which I am not, a more refined version mixes better. 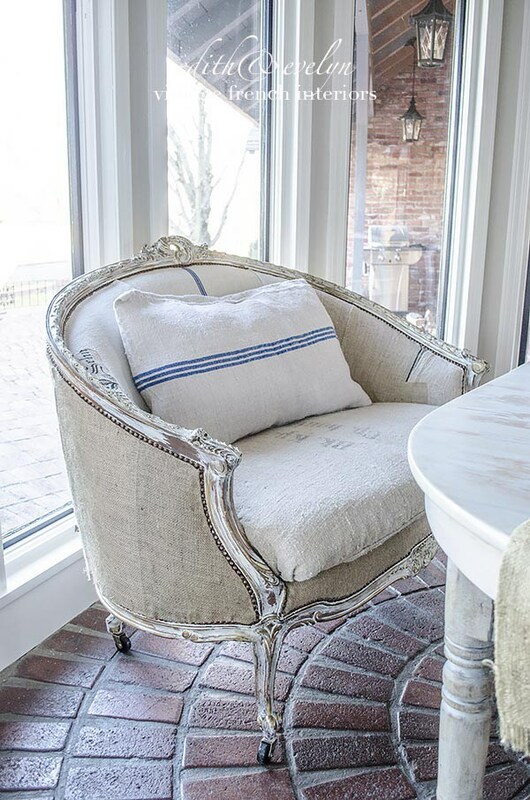 Using upholstery fabrics instead of burlap and maybe the velvet seat. Just buy enough material to cover the back when the trend runs its course. You can have your cake and eat it too! Hi, Maureen! I so agree with you! I ended up completely reupholstering my sofa in a light gray fabric. Even though I like the deconstructed look, I didn’t think I’d keep it for long! Have fun with your project!! !